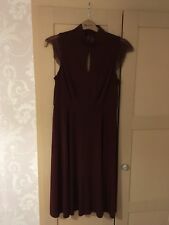 Jemma jersey maxi occasion dress from Coast. keyhole detail to the top. large keyhole to the back. maxi skirt with deep front split. in a navy jersey poly with elastaine for gentle stretch. round neckline. Originally sold for £39.00 but now priced for a quick sale. Waist darts front and back for added shape and structure. Material 100% Polyester. Care Machine washable. Concealed side zip. Length shoulder to hem 35", across chest 23". COAST Navy Blue Cleo Lace Cocktail Evening Midi Dress Size 10 Brand new with tags Pretty and feminine, the Cleo Midi Lace Dress is a stylish choice for bridesmaids. Featuring a lace illusion neckline, cap sleeves and pleated skirt with lace panels, it works beautifully with a variety of venues from church weddings to city ceremonies. This dress measures 121cm from side neck point to hem. The skirt area gathers on the hip/waist area to give a flattering contour to the waist line. There is a slit on the side of the leg, adding eye catching detail from top to bottom. This is like a gold thread throughout but gives the comfort and flexibility to fit to your shape. 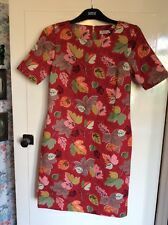 V by Very Floral Navy Printed Tunic Dress Size 8. This is a pretty blue style skater dress by Fever London in a size 10. The dress is a rich shade of blue and features a round neck with pleated tucking detail to the neckline. The neckline features a keyhole notch to the back of the neck which fastens with a single button.